EKK: Manuela Boy! My Dear Boy! Who’s Coming Up on Monday, February 22? Monday, February 22, 6 p.m. – 9 p.m.
No mo’ five cents, No mo’ house. This ditty that we sang as kids took on real life form for us when we met Lito Arkangel, a home-grown product of Kea`au on Hawai`i Island. Today a popular musician, dedicated teacher, father of three children with his beautiful wife Rayna, Lito still embodies many of the qualities of the delightful Manuela Boy we all knew in our lives growing up. When Lito sings, he sweeps his listeners along with the sheer power of his performance, his dynamic and often surprising falsetto, his animated expressions, vigorous `ukulele strumming and the many stories that share his personal connection with every song. Without that personal connection, the songs lose their meaning to Lito; without that meaning, the songs do not have the power that he packs into every performance. 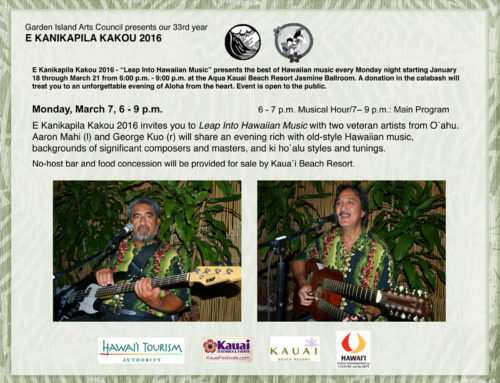 It was certainly a treat to have this artist share his music on Kaua`i. Accompanying him on steel guitar was his silent partner with his vast experience and musical mana packed into the awesome strains of his vintage Rickenbacker Lap Steel Guitar. Dwight Tokumoto, a long time teacher in special education in San Jose and Hawai`i, today spends his partial retirement working at a Charter School in Hilo. This gives him a lot of time to pursue his musical passions, something that started many years ago when he bought his first $25 Dobro at a garage sale. It was so old that parts of it were screwed together. He’s come a long way and today plays music with the Kahulanui Big Island Singers, a nine-piece Hawaiian Swing Band. Dwight is married to Pua Tokumoto who produces the Tahiti Fete in Hilo. Together, they operate the Waipunalei Hawaiian Coffee Farm in Laupahoehoe. If you ever have a chance to sit and chat with this fine gentleman, you will discover a fascinating person with a lifetime of musical experiences. Lito’s stories set the stage for each song that he chose to share, beginning with a short chant. Many of the songs were well known favorites but his passionate delivery was truly Lito’s own style and interpretation. In Hawai`i, there are two kinds of pohaku, or rocks. The rocks full of puka, or holes, are like women; they can take a lot of heat. The solid rocks are like men, you heat them up and they crack and explode. With this observation, he dedicated his first song to women. Gently picking out the melody on his ‘ukulele, Lito chose the perfect song for his voice – sweet, soft, sometimes soaring, melodic, full of emotion. Pua `Olena by Jimmy Kaholokula, is a song that exemplifies humility . . . a quality that has been pounded into Lito by his mother, his kupuna and all the wonderful women who healed, supported and fed him. The graceful hula dancer Kainani Viado, dressed in her Valentine red, shared her dance. Lito sent this song out to the entire Kaholokula family who just lost Robbie, younger son of composer Jimmy Kaholokula. Lito has that indescribable quality and charismatic personality that makes you want to just hang out with him. When he’s singing you want to call out, “Don’t stop singing!” Lito poured his heart out with his amazing falsetto in his favorite love song Kealoha. He loved that his music prompted the hula dancers, Mahina Baliaris and Yumi Teraguchi-Locey, to share their hula. He spoke about the composer of one of his favorite songs; she hails originally from Anahola and now makes her home on Hawai`i Island. When he was a 17-year-old high school senior who also attended college at UH Hilo, he met Kainani Kahaunaele. As a youngster he loved the boxes of 8-tracks that belonged to his Dad, a Viet Nam vet who worked in the plantation factory. Lito used to play them and especially loved the music of Karen Carpenter. He sang her song, Close to Me because he felt such a connection to that song. When he met Kainani, he believed that Karen Carpenter had come back into his life as Kainani Kahuanaele, his Hawaiian Karen Carpenter. He said that she is today one of the most successful haku mele artists in Hawai`i with songs that have so much depth and meaning. One day Kainani needed to record the song Lei Ho’oheno for a friend’s wedding since she could not be there in person. She asked Lito to sing the background music and play the `ukulele for the recording “because you’re a better `ukulele player than I am.” He was so stoked with her compliment. He said that the `ukulele is the easiest instrument to learn to play but it’s also the most difficult instrument to master because there is so little to work with. He was surprised to learn that Kainani had composed that song for her friend Maikalani, whose daughter turned out to be Lito’s niece. Small world and a really special personal connection to the song. He talked about Hale `Olelo, a beautiful new building on the UH Hilo campus where Hawaiian culture will thrive. Larry Kimura wrote a wonderful song called Kulaiwi, orNative Land, for this building. Lito’s enthusiasm as he spoke about the building and the song that Larry Kimura wrote was so contagious that it made you want to fly over to Hawai`i just to take a look at it, a testament to the efforts of all those who played significant roles in making the resurgence of the Hawaiian language a reality in this lifetime. Preparing to come to Kaua`i, he asked Kumu Kimura if he could share this song with the people of Kaua`i. It’s not a well-known song but one that he loves. Lito needs a personal connection to each song in order to sing it. One way he makes that connection is to play, play, play the song until he gets sick of it. It then becomes his own to really sing and interpret in his own style. This is what he did with the song Pua `Ahihi by Maddy Lam and Mary Kawena Pukui. What was his connection with this hula classic? His friend Rupert Tripp Jr., who is like his big brother, took him to play a duet at the Brown’s Beach House Restaurant, a place where the hula dancers rule. These kumu hula dancers choose the songs that the musicians are to play. He talked about Danny Girl, a veteran hula dancer who always “allowed” the musician to play the first verse so she could make a graceful entrance when they sang the first verse again. Danny Girl danced to Pua `Ahihi which Lito learned just to play for her. When he and Rupert Jr. were hired to play at Breakfast at Tiffany’s at Waikoloa, the wealthy clientele took so long to exit after the event that they ended up singing Pua`Ahihi eight times in a row. He wanted to record the song on his CD. Sadly, he learned that Danny Girl had passed away from cancer, but he was glad he had the chance to play for her. Because of the controversy going on up at Mauna Kea, some of his students ask if they could skip class to participate in the protest. He told them to make sure all within their kuleana was done first before they go up to the mountain. “Which is more important? Your education or Mauna Kea?” He posed that question to the students. Of course, they chose to go up to the mountain, but Lito chose to mark them absent. 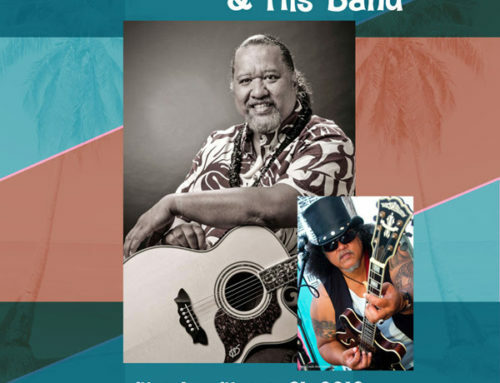 His favorite musician is Gary Haleamau, who used to play for many years in Waikiki in the days when Hawaiian music was everywhere and now resides in Las Vegas. Gary’s family wrote a song about the mountain between Mauna Kea and Mauna Loa, a place called Pohakuloa. What an extraordinarily beautiful song, and Lito’s falsetto is simply at its best in this song. When asked to play on the Kamoa `ukulele that was going to be given to one lucky winner, he sang another kupuna favorite from west Hawai`i. I Kona is truly his kind of song; it gave Lito a chance to hit the rafters. After intermission, the Kamoa `ukulele was won by Stan Greenbaum, one of our loyal snowbirds who lives part time in Kapa’a and part time in Colorado. Sitting in the front row, he took a hop, a skip, and a jump to pick up his `ukulele. Just as Elton John sang about how he wished he had met Marilyn Monroe, Lito wished that he had met Aunty Edith Kanaka`ole while she was alive. He is thankful that he is very close friends with their entire family — daughters, grandchildren, great grandchildren, all of whom follow closely in her footsteps. He was honored when Kekuhi Kanaka`ole haku mele, or composed an `oli for his CD release party and told him that he was special. He feels a close connection with Edith Kanaka`ole because of her song Ka `Uluwehi O Ke Kai. He feels that the ocean is such a profound resource that provides everything that one needs and that it is important to malama the ocean. He believes that Hawai`i is a place where self-sustainabilty is possible but we all need to do it together. When he was playing music in Japan last April, he invited the Japanese hula dancers to stand up and dance wherever they were and was thrilled to see dancers popping up all over the concert hall in which he was singing. Another thrilling thing was a shout-out, “Welcome to Japan, Bruddah Lito!” from the famous Sumotori Konishiki who had come to see him perform in Japan. Just as they did in Japan, many hula dancers at EKK went up to perform to this classic hula – Namaka Lindsey, Mahina Baliaris, Elena Gillespie, Kainani Viado, Pua Raines, Alex Nelson and a lovely snowbird. There was so much joy and enthusiasm in the way Lito sings Ka `Uluwehi O Ke Kai. He made it seem so fresh and new. An interesting point Lito made was that in Hilo nobody claps. It’s disturbing to some artists, but that’s just the way it is in Hilo. There is so much talent on the island and there are parties all the time; lu`au for every occasion happens every weekend. Lito asked himself what his kuleana as musician was at a lu`au. A birthday lu`au for a one-year-old is not for the musician; it’s a mahalo for everyone who helped to raise the baby during the first year. The party is not about the musician; a musician is there to complement the celebration. So he is fine with no clapping or applause when he plays. The majority of his gigs are comprised of playing at the Celebration of Life for the departed. He sings to help heal people. Sometimes he is so moved by the pent-up emotions that he has to excuse himself to his car and call his wife to tell her how much he loves her. It makes him realize how short and precious life really is. Funerals are a time to pay final respects for the departed and all the energy must go to the mourning. Lito meant to share the song Kaleohano as his Leap Year surprise, but another song came up and took its place on his playlist. It turned out to be one of the most moving songs of the evening. He heard this song when playing with Ernie Cruz, Sr. at the Lei`aloha Ranch. Closing his eyes, he took his time in each song so you could get the essence of the melody and the lyrics, often shifting from a whisper to a full crescendo as the emotion of the song dictated. “English and Hawaiian songs are often closely related,” said Lito, as he went into an unexpected medley combining a beautiful song sung by Willie Nelson, Angels Flying Too Close to the Ground, with Manu O’o. Singing back and forth between the two songs, one could feel the connection of the imagery between the flying angels and the graceful flying bird of Hawai`i. Lito’s soulful version of Manu O’o is truly memorable. Dwight’s steel sounds were so perfect for this song. Lito warned about growing up kolohe (rascal) on a small island because word really gets around if your actions are not pono. He shared Princess Kekaulike’s song written in the 1880s about flirting in the rain in Hilo. That unusual rain is called Kani Lehua with sudden loud bursts of torrential rain that stops as quickly as it starts, often on a hot sunny day. He demonstrated how the rain falls in sudden heavy bursts . . . like gossip. Kauai I Ka Nani `O Hilo is about a man and a woman stuck in the rain with the conversation going back and forth between the two. He once had the idea of singing both parts of the conversation with his low bass voice and his high falsetto, but decided he should just sing the male version. He wanted to sing it with the suave charm and swagger of Johnny Almeida who in his day was the smoothest operator who used to sometime sings as long as eight hours on the radio. As he sang he tried to embody every bit of what he saw in the charming Johnny Almeida. This song was connected with his story of how he and Rayna ended up together. It happened at the Pali Room at the famous Naniloa Hotel, a party place nicknamed “Break Wallet” because the drinks were so expensive. Thinking she had winked at him, or maybe she got something in her eye, he went to ask her to dance but was turned down flat and felt hurt and downhearted. After several attempts to reach her by phone, he gave up as she showed no interest in him. One day a mutual friend told him, “My friend Rayna like check you out.” Of course his wife Rayna’s version is that the same friend came and told her, “My friend Lito like check you out.” A true matchmaker, her ploy worked. He wished he knew this song back in those days; it might have made it easier to hook up with her. Long story short, they are now happily married with three children. Probably the song that was the most emotionally charged was his version of E Ku`u Morning Dew by Larry Kimura and Eddie Kamae. Lito sings with so much gusto, his face registers every possible emotion written into the song, moving from deep guttural sounds like old-time Hawaiian singers to the sudden high falsetto. He sang it first in his regular voice and the second time in his falsetto voice. “This song is my ‘reset button’.” When things go wrong he wakes up and sings this song and everything is all right again. He said this song goes out to anyone going through an ordeal right now. He knows how to make things right with his music because he is so sincere and authentic. As the music dies down and the magic angel dust settles, fans walk out the door with great sighs of appreciation for the music and the artists they just experienced. Here is one talented artist touched by the gift of God who will keep that humbleness because at his very core he is still a Manuela Boy who remembers his roots. To Lito: Never lose that, because that is the very essence of what makes you such an exceptional musical messenger. 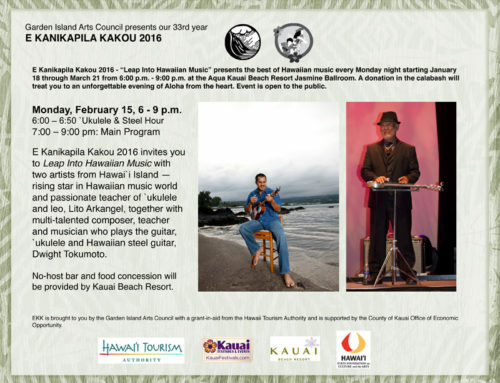 E Kanikapila Kakou 2016 Hawaiian Music Program is funded in part by the Hawai’i Tourism Authority, the County of Kaua’i Office of Economic Development, and the Garden Island Arts Council supporters with support from the Kaua’i Beach Resort. Who will win Harajuku `Ukulele painted by Max Graham? Tickets for Concert will go on sale at EKK on February 22 Monday BEFORE the Fashion Show begins.